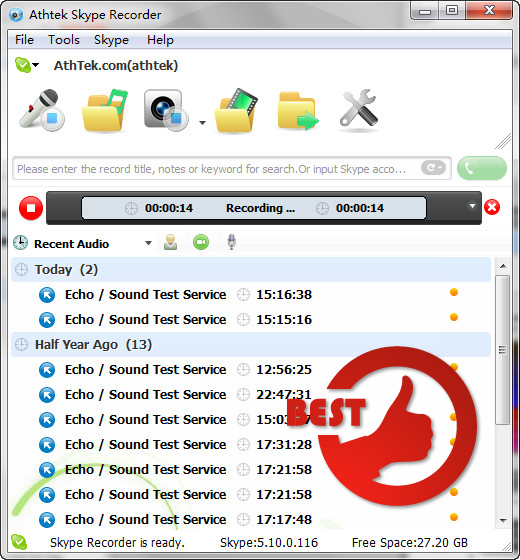 Audio Record Wizard is a Audio & Multimedia::Audio File Recorders software developed by NowSmart. After our trial and test, the software was found to be official, secure and free. Here is the official description for Audio Record Wizard: NowSmart Studio has released the new version of Audio Record Wizard, a real time Windows sound recorder and playback program that is easy enough for novices to use, and powerful enough for professionals. Audio Record Wizard works directly with your sound card to create CD quality recordings from a microphone, stereo equipment, streamed audio, and from software such as Windows Media Player, Winamp, and RealPlayer.For the hobbyist, creating a recording is as easy as selecting a recording device, setting the recording quality and volume, and clicking the Record button. Whether you're using a microphone, a music playing program, or a line in feed from your stereo system or Walkman, Audio Record Wizard makes it easy to create a recording. If you have a fast computer and you're not running other CPU intensive programs, you can record a MP3 file directly to your hard drive. If you're using a more limited system, you can create a WAV file, and convert your recording to MP3 format later.Serious music lovers can use Audio Record Wizard's powerful options to fine tune their recording. You can select 11, 22, or 44 KHz sampling rates, and create 16 bit stereo or mono recordings. You can set the bit rate from 32k per second, which is ideal for creating tiny files of low quality voice recordings, to 320k per second, which is designed for the highest quality recording. The program supports variable bit rate (VBR) encoding of MP3 files. You can even set the program to skip silent passages, and stop recording after a user defined period of silence. Whether you're interested in recording high quality music, creating voice recordings for business associates, or sending personalized voice messages to your family and friends, Audio Record Wizard makes it easy to create high quality recordings. NowSmart Studio has released the new version of Audio Record Wizard, a real time Windows sound recorder and playback program that is easy enough for novices to use, and powerful enough for professionals. Audio Record Wizard works directly with your sound card to create CD quality recordings from a microphone, stereo equipment, streamed audio, and from software such as Windows Media Player, Winamp, and RealPlayer.For the hobbyist, creating a recording is as easy as selecting a recording device, setting the recording quality and volume, and clicking the Record button. Whether you're using a microphone, a music playing program, or a line in feed from your stereo system or Walkman, Audio Record Wizard makes it easy to create a recording. If you have a fast computer and you're not running other CPU intensive programs, you can record a MP3 file directly to your hard drive. If you're using a more limited system, you can create a WAV file, and convert your recording to MP3 format later.Serious music lovers can use Audio Record Wizard's powerful options to fine tune their recording. You can select 11, 22, or 44 KHz sampling rates, and create 16 bit stereo or mono recordings. You can set the bit rate from 32k per second, which is ideal for creating tiny files of low quality voice recordings, to 320k per second, which is designed for the highest quality recording. The program supports variable bit rate (VBR) encoding of MP3 files. You can even set the program to skip silent passages, and stop recording after a user defined period of silence. Whether you're interested in recording high quality music, creating voice recordings for business associates, or sending personalized voice messages to your family and friends, Audio Record Wizard makes it easy to create high quality recordings. you can download Audio Record Wizard free now. Want to be notified when Audio Record Wizard is updated? Please be aware that DownloadPipe do not supply any cracks, passwords, patches, serial numbers or keygen for Audio Record Wizard,and please consult directly with program authors for any problem with Audio Record Wizard.